Showing results for tags 'action figure'. Seeing that there's no thread specifically for Storm Collectibles Action Figure line, I decided to make one. I love the Tekken game on Playstation and for some reasons, the only great action figures that came from this game are the PlayArts Kai of Kazuya and Jun which I didn't have since they're too glossy for my taste. There were numbers of old Bandai figure released from Tekken3, but it didn't grab my attention. When Heihachi was announced last year, I preordered one with hopes that Kazuya or Jin will come next. If not, atleast, I can get Ryu or Akuma from this line as well to go along with Heihachi -- to mimic Street Fighter X Tekken. But after doing some research the other day, I found out that they will indeed do Kazuya next. So I guess, it's just appropriate to create this thread dedicated to their Action Figure line. I know they have a 1/6th scale line, but let's post that on the respective 1/6 thread that we already have. From what I've seen based on reviews at YouTube, everyone seemed to like it. Looks like they're doing a great job. I noticed that they somehow market these figs as 1/12, but when I try to search online Ryu's character height for example, it seems that he's in the 1/10th scale rather than 1/12th. The Figuarts counterpart however is near the 1/12 range somehow. I'm sure at the end of the day, it's nice to have some of our favorite fighting game character in scale with each other so that we can do our own cross-over matches. Anyways, I will just post here photos taken from their Facebook page during this year's Toy Fair in New York. I will add more info down the line such as video reviews from YouTube and any tid and bits found somewhere. Just browse their main site if you want to learn more of what they've already produced. Most are still available at BBTS. And please, if you find any info or upcoming news, and if you have yourself some Storm's Action Figure, please feel free to post it here. And to be honest, I really don't want to start another line, but how can I resist TEKKEN now since they already announced my favorite evil dude -- Kazuya. no3Ljm posted a topic in The Workshop! Hi. Just wondering if anyone here already used a Glow In The Dark paints to their model kits and other stuff? Can you tell me if there's something clear or transparent glow in the dark paint available and what brand and where I can buy it? I'm thinking of a small project that somehow require to use a Glow In The Dark paint rather than me busting out the figure to put LED lights into it. Esp if the figure wears plastic/rubbery clothes. The plastic garment already have a yellow color which I would still like to use as its base color. So what I'm thinking is to light up that section (yellow part of the garment) a little when placed in a dark room. I'm also looking for glow in the dark paint that comes in 'clear blue'. So basically, what I'm looking for is something that I could just paint it on top of the said color part of the figure. Anyways, hope you can point me to the right direction. Thanks so much. 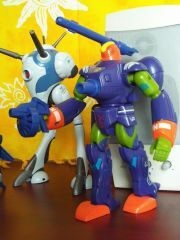 "Botoru Battalion" Nosjadeul Ger, which is a color variation of the toy that Matchbox did to represent the Quaedluun Rau. But their other "Quadrano Battalion" colorway was the SDFM colorway for the male armors. Confusing, but it's a nice toy if you can pick it up for $20 or less. And by 'toy', I do mean 'toy': colorful, imaginative, sturdy, but not a collector model concerned with slavish attention to its source material. The box photos don't do the toy justice, unfortunately. 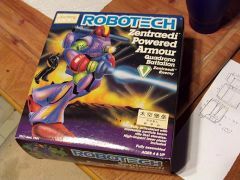 I'd have probably bought one in the 80s if the prototype model didn't look so shabby and the box art (in this instance) look so rough & juvenile. Recent case-fresh (!) purchase - Harmony Gold edition of Matchbox Nosjadeul-Ger toy: "Quadrono Batallion" - female Zentraedi, I guess based on the name given to female armor in the Robotech adaptation,since Matchbox didn't make a Q-Rau toy. These aren't so bad, really. They were actually designed & originally tooled-up by a Japanese company. The rendering reminds me a lot of Clover's last few Dunbine toys. The colors of this edition differ a bit from the earlier Matchbox edition, and the later ExoSquad edition. 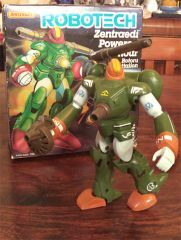 Recent case-fresh purchase - Harmony Gold edition of Matchbox Nosjadeul-Ger toy: "Quadrono Batallion" - female Zentraedi, I guess based on the name given to female armor in the Robotech adaptation, since Matchbox didn't make a Q-Rau toy. These aren't so bad, really. They were actually designed & originally tooled-up by a Japanese company. The rendering reminds me a lot of Clover's last few Dunbine toys. The colors of this edition differ a bit from the earlier Matchbox edition, and the later ExoSquad edition. Decals are kind of iffy. They don't fit well to the compound curves in many surfaces on the toy. But the joints are nice & tight.